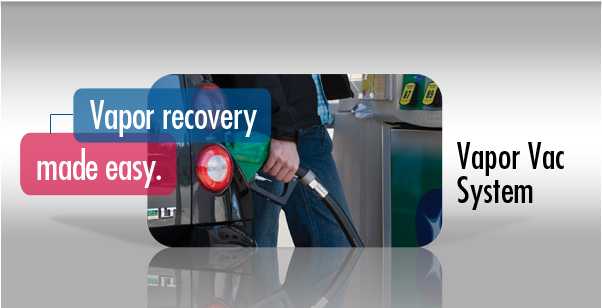 VaporVac® vacuum assist vapor recovery system dispenses fuel 30% faster than typical balance vapor recovery systems. The equipment is less bulky, so customers will be happy with the easy-to-handle hoses and nozzles. The VaporVac system meets EPA requirements for Stage II vapor recovery. VaporVac uses pulser signals from the meters to track real time flow rate of gasoline. Customer places the VaporVac nozzle in the vehicle (no bellows to compress). VaporVac pump creates a vacuum that removes vapors from the vehicle's tank. The vapors are returned to the fuel storage tank through standard balance system underground vapor painting. The vapor pump controller regulates pump's speed proportional to fuel flow rate. *Note: For Blender X+1, VaporVac is NOT available for the "+1" product (whether diesel or gasoline).